Recently, scientists demonstrated Vietnam was the first region in the world production of tea leaves. Tea in Vietnam is different from the definition of tea in China, Japan, India. In particular, notably Hanoi lotus tea. Speaking of Vietnam tea art often prompts people to enjoy tea of Hanoi. Elegance, elegant, sophisticated in the cuisine of Hanoi improve the aesthetics of the tea cup on a very high level. If people in other areas like tea “simple” (tea is not scented) in Hanoi, many families prefer marinated lotus tea, jasmine tea and daisy tea. 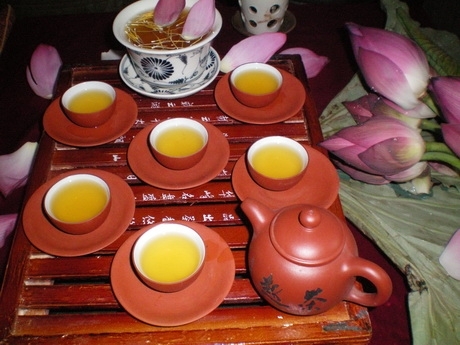 In particular, lotus tea is a tea that you just warmly to his guests or as gifts. Want to Hanoi lotus tea with the characterized fragrant lotus so the marinated lotus tea is selected to the West Lake lotus. 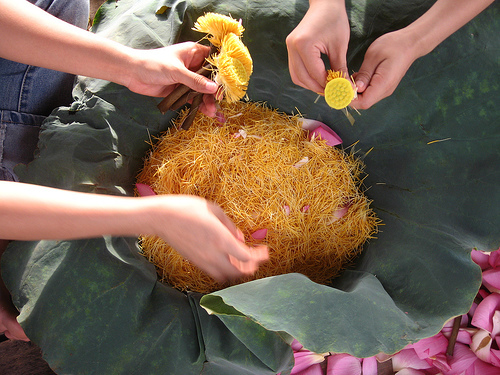 Each tea weight must be used from 1000 – 1400 to marinated lotus, customized to the small and must be picked before dawn. The lotus flower still keep mist on it is extracted and then take the “rice grains of lotus – called Lotus Rice ” , one tea layer on a lotus rice layer. Lotus Rice is the lotus scent bag, grab the lotus rice seemed to make simple but not crushed lotus rice, no drying, retains the pure lotus flavor is an art. Finally the tea is covered by paper. Marinate 5-7 times so repeatedly, each time re-marinated and then dried again. It is so hard elaborately only for ten of lotus tea teapot. Lotus tea is delicate from the step of the selection tea to choose lotus to marinate. In ancient times, people often use “ Tra Man” with big leaves tea from Ha Giang to marinate lotus tea. “ Tra Man” use to marinate lotus tea is not easy to make, not only dry the tea leaves you also must do many steps elaborately. The essence of lotus tea is tea art, from ancient times, tea was considered elegant pleasures of the writers, artist, only with old gift pack of teapot in this paper that feelings of gratitude for all. Therefore, when friends come, they invite their intimates a cup of lotus tea.